Evanston filmmaker Michael Frolichstein answers questions about Celiac disease alongside pediatric gastroenterologist Vincent Biank and dietitian Carrie Ek. The panel discussion at the Evanston Public Library event followed a screening of Frolichstein's documentary on the illness. Evanston filmmaker Michael Frolichstein presented his documentary Wednesday night about Celiac disease, an autoimmune disorder that leads to damage in the small intestine upon the ingestion of gluten, and spoke about his experience with the illness. 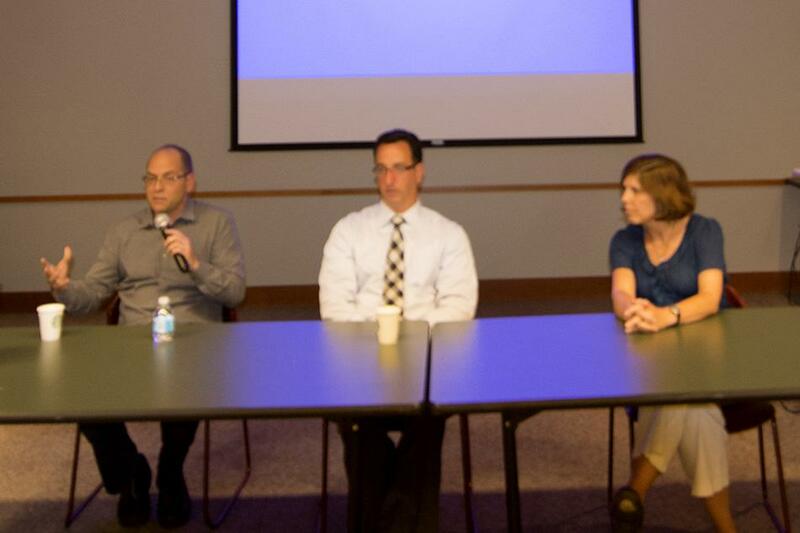 About 80 people attended the Evanston Public Library event that included a screening of Frolichstein’s film, The Celiac Project, and a discussion panel led by Frolichstein, dietitian Carrie Ek and pediatric gastroenterologist Vincent Biank. Frolichstein said he was diagnosed with Celiac disease at age 40 after many years of difficulty. Frolichstein said all it took for him to begin his recovery was a visit to a doctor for a blood test for Celiac disease. Frolichstein found interviewees in local areas and on the East Coast, as well as some via social media, he said. As he worked on making the documentary, Frolichstein spoke to other people diagnosed with Celiac disease and top experts on the autoimmune disorder, he said. Ellen Frolichstein, Michael Frolichstein’s wife and a co-producer of the documentary, said her family was fortunate the International Celiac Disease Symposium was hosted by the University of Chicago in 2013, giving them an opportunity to speak with experts. Ellen Frolichstein said EPL seemed like a natural fit for the screening of the documentary, because her husband grew up in Evanston. The documentary took about five years to make and was partially funded by a Kickstarter campaign that has raised more than $35,000. Lesley Williams, the head of adult services at EPL, said she thought screening the film was a great idea because documentaries are one of the important things public libraries can offer their patrons. Evanston resident Maggie Wade said she came to the event because she was recently diagnosed with Celiac disease. Attendee Neta Jackson, an Evanston resident, said she was diagnosed at age 65 after complications following intestinal surgery. Jackson said eating at restaurants is a big challenge because she can never be certain there is no cross contamination in the food she orders. Jackson learned a few new things about the disease from the documentary, she added. Michael Frolichstein said he hopes this documentary encourages conversations about the illness.